Handloom – Wearing art everyday ! When you wear a handloom product its like wearing art everyday because the same colour, same style of weaving will still result in a unique product since its handmade !! Co-optex’s MD Mr. Narasimhan is doing an amazing job of reviving old weaving techniques and sustaining the weaver families. He has also introduced newer contemporary designs which has made sari addicts like me to completely shift over to handlooms and Co-optex. Don’t miss the card that states the name of the weaver and details of how this sari was weaved. By introducing this card, Mr. Narasimhan has ensured that we know the artist whose art we are wearing. 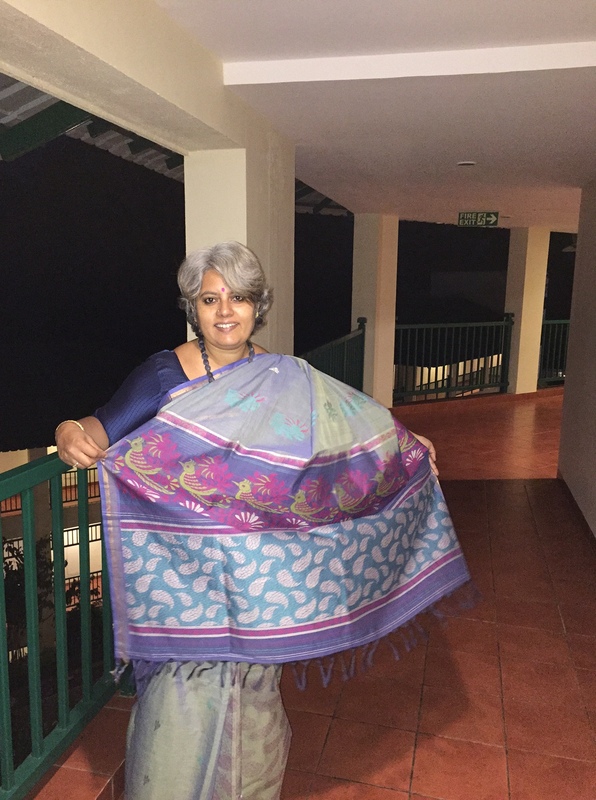 This sari is an organic cotton made at Vadambachery. There are several pictures because I can’t get over the amazing detailing in the pallu and the pleats have the same “ambi” design as though they have been traced on a tracing paper – exquisite. 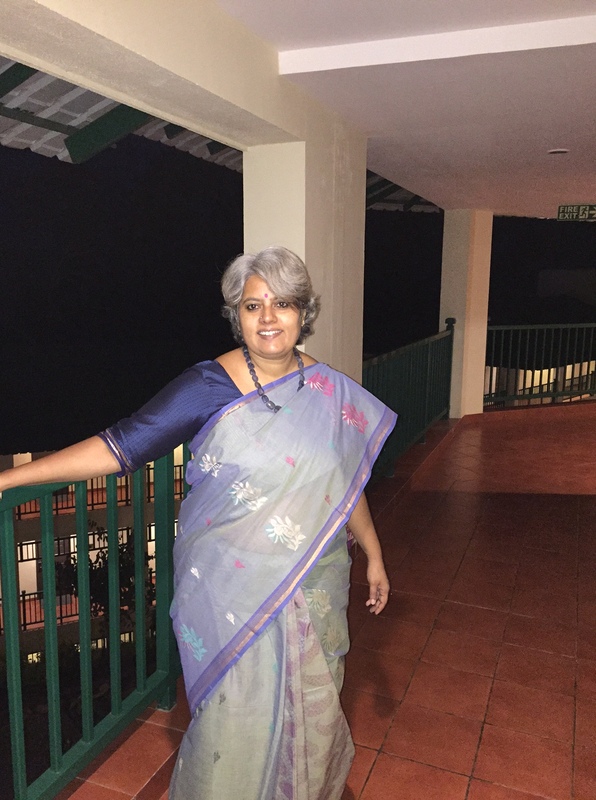 I wore this sari in Munnar on June 20th, when we went to Coimbatore. The neckpiece is from Desh Maheshwari, a bluish grey stone. Thiru Dhandapani’s hands and legs moved 20,000 times to create this beauty…. what amazing effort !! unbelievable. Can you take your eyes off this ? 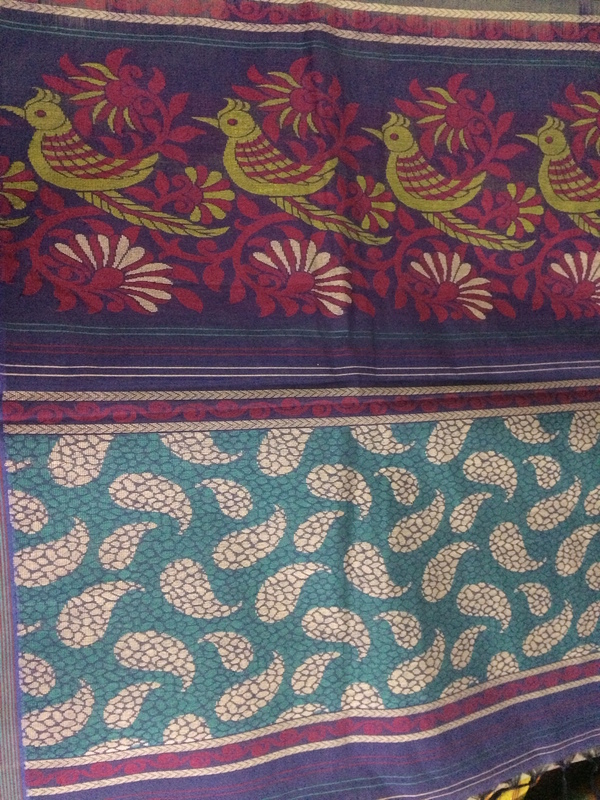 This is the Pallu … you will be forgiven if you think this is painted/printed. Stunning artistry. Am wearing a Khunn blouse. Here’s some additional detail about Vadambachery organic saris from Mr. Narasimhan – “Vadambachery Organic Cottons are very special and highly recommended for Summer wear. These Sarees in display here are special due to the Organic Cottons that are dyed using natural dyes made out of Banana Flower and Turmeric extracts. Cooptex is proud to be a pioneer Weavers Society to have established a brand name in these Organic Cotton Sarees”. Don’t miss the exquisite weaving in the pleats. Some skill Thiru Dhandapani has ! My my, gorgeous this is. 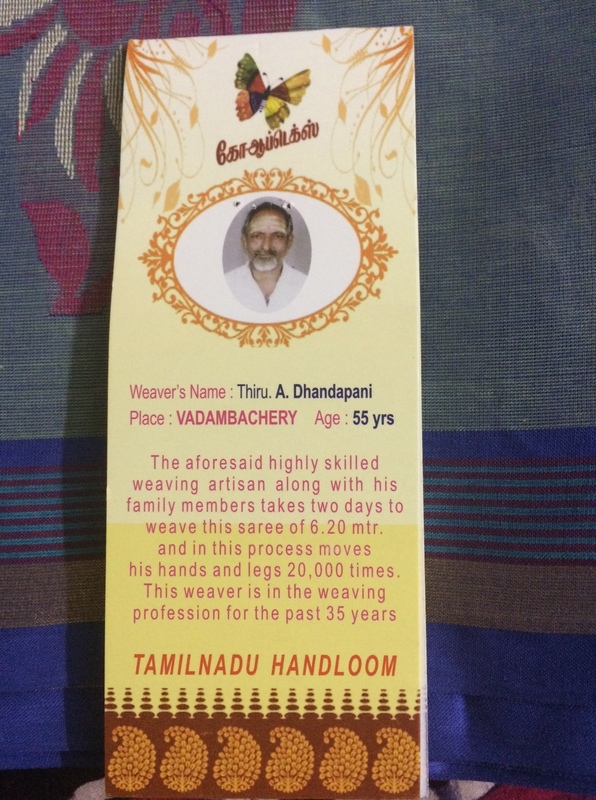 I salute the weaver.